Global warming in the Arctic is creating business opportunities for Japanese companies, including the exploitation of oil and gas resources. The thawing of Arctic ice will not only facilitate access to natural resources but will also open up new shipping routes, sharply reducing the time required for shipping between Europe and Asia. However, many challenges remain, including the need for reduced resource-development costs, environmental conservation measures and arrangements to prepare for maritime accidents in the region. Last December, a group of Japanese firms including Inpex Corp. acquired oil-drilling rights at two sites off Greenland, an autonomous Danish-dependent territory. This is the first time that Japanese companies have obtained oil drilling areas in the Arctic Ocean. In 1998, the Danish government began calling for oil companies from abroad to begin prospecting in the region. The Japanese companies’ acquisition of drilling rights marks the start of the Danish-envisioned project, 25 years after it was announced. The length of prospecting contracts for locating oil reserves is set at a maximum of 16 years, two to three times as long as ordinary oil-prospecting deals. The longer terms have been granted because prospecting can be conducted only in summer, for three to four months a year amid the Arctic climate, according to Inpex. There are fears that oil rig construction costs may swell beyond expectations, as they must be strong enough to endure such hazards as huge ice drifts and chunks of thawed ice falling into the sea. Even so, the benefits could be great. “It (the Arctic region) is extremely promising among the world’s untapped frontiers, and we believe our project will serve as a foothold for development that will benefit our children and grandchildren,” said Yasuhisa Kanehara, managing executive officer of Inpex. In 2008, the U.S. Geological Survey estimated that the Arctic, including the Arctic Ocean, accounts for 30 percent of the world’s untapped natural gas resources and 13 percent of its crude oil resources. But despite the potential, success is not ensured. Business interest in the thawing Arctic goes beyond resource development. Weathernews Inc., a Japanese company specializing in weather information services, launched a small satellite in October last year to observe the behavior of Arctic ice with an eye to providing weather information to vessels passing through the Arctic Ocean starting this summer. More than 400 ships have reportedly filed applications with the Russian government for permits to pass through the ocean. The Arctic Ocean sea routes in the vicinity of Russia, where ice melts earlier than in the rest of the region, are used the most frequently. Only four cargo ships passed through the Arctic Ocean in 2010, but 71 did so in 2013, according to Weathernews. The Arctic route is the shortest passage linking Europe and Asia. The number of days required for passage from Norway to Japan via the Arctic route, for instance, is about the half that of traveling by way of the Suez Canal, while risks of vessels being attacked by pirates are far lower in the Arctic. 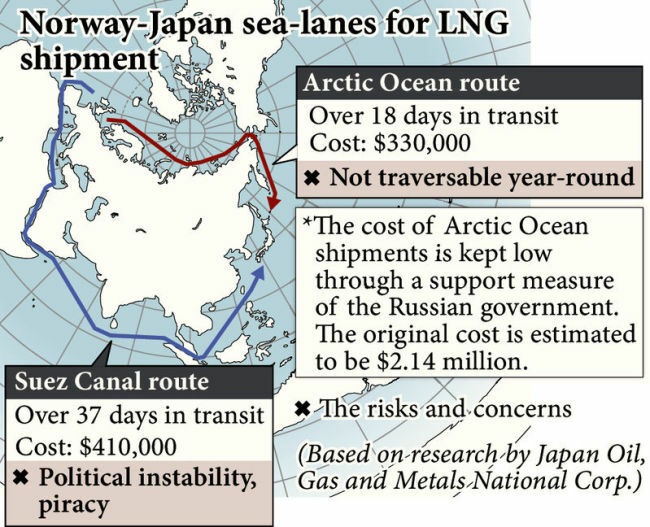 The Russian government is keen to see Arctic sea-lanes expanded to ensure exports of the country’s resources to Asia, in the expectation that shale gas being developed in the United States as a new energy source will be sold mainly to Europe. Among major tasks that must be addressed before full-fledged development of Arctic resources is realized are how to make the development projects compatible with the need to ensure relief measures in the event of a maritime accident, compilation of detailed marine charts of the Arctic and conservation of its environment.